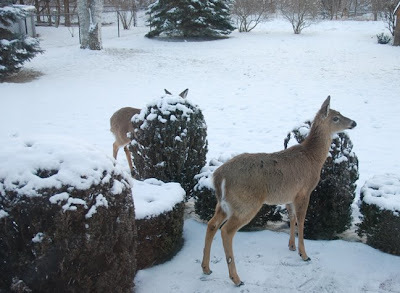 At 7:00 this morning, Mom yelled that the deer were right up on the patio. I snapped a pic and then tapped on the window to shoo them away. These two joined their mother who is visible in the photo out in the back field. Click to enlarge. Great pic of the deer. They'll be glad when the snow is gone and the grass starts growing. Won't we all! Great pic! The deer are coming closer now --- the forest grub must be running out! We've still got snow here but it's melting fast!